The StinkySocks Hockey Skills Program is generally geared towards skaters within the first five years of their hockey experience, but can be beneficial to players of all levels. This is not a learn-to-play hockey program, but a program for players looking to improve their enjoyment of hockey by further developing their fundamentals (shooting, passing, body control, skating). We limit the number of skaters who can participate and offer the lowest player to instructor ratio of any New England area hockey program. StinkySocks Hockey Skills seasons are usually 10-15 weeks in length, although some skills sessions may be available as individual sessions. Save money by booking the full season. Click here for a listing of current Hockey Skills sessions. The StinkySocks Hockey Skills+ offers a Hockey Skills session immediately followed by a novice (D) level No Commitment Hockey game. The hockey game is officiated by the instructors from your skills session who will offer you in-game tips and advice. 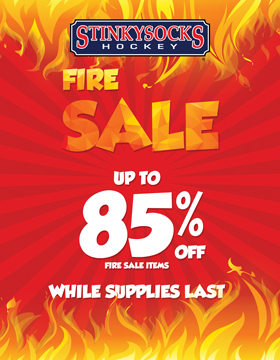 Save money by booking a Hockey Skills+ season. See the current Skills+ offerings, listed under skills clinics. Stinky Socks Hockey shooting practice allows you to spend quality time with the puck that you will not get in a game. Stinky Socks Hockey Shooting Practice piggybacks the goalie clinics and is offered for a nominal fee. You’ll have some time to practice on your own and then we’ll ask you to take a series of specific shots on goalies. Shooters must be at an intermediate (C) level or above to ensure that our goalies are also receiving a benefit. When available, shooting practice sessions are listed under No Commitment Hockey.